The Revelation Astro 2x Barlow Lens is an excellent choice for those in search of a good quality, good value 1.25" barlow lens. 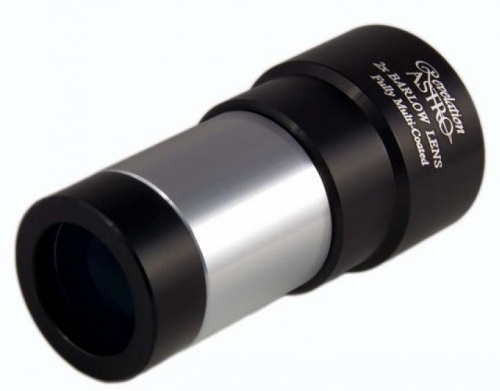 Featuring fully multicoated optical surfaces and neat, compact design, this barlow will be of great use both visually and photographically with a wide variety of telescopes. The Revelation Astro 2x Barlow Lens comes with contrast-boosting blackened edging and an unscrewable, removable optical assembly, which can be screwed into a wide variety of eyepieces and accessories via a standard 1.25" filter thread. This alters the effective magnification of the barlow element, and is dependent on the spacing of optical surfaces. The ususal spacing in an average sized 1.25" eyepiece yields a magnification of around 1.5x when used in this fashion. This element removal can be very useful when attempting webcam imaging of the Moon and planets.